Buttes are similar to mesas in that they are flat-topped hills with steep sides, although they are much smaller than mesas, and tend to stand out as isolated landscape features. The Zuni Buttes are a group of such rock formations located in the northwestern corner of the Zuni Pueblo Reservation in western New Mexico. 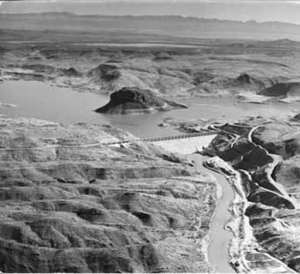 Aerial view of Elephant Butte Dam on the Rio Grande, Sierra County, New Mexico. A photo taken by Sprouse, Len in 1949.